SAN FRANCISCO – February 2, 2011 – ECOtality, Inc.(NASDAQ:ECTY), a leader in clean electric transportation and storage, announced today that it has expanded The EV Project to the San Francisco Bay Area. ECOtality was awarded a $2.87 million contract from the Bay Area Air Quality Management District (Air District) to become the Project Manager of the organization’s Electric Vehicle Supply Equipment (EVSE) Deployment Program. Through this program, ECOtality will oversee the installation of 2,750 home charging stations and 30 DC fast charging stations throughout the Bay Area. ECOtality will install 20 Blink DC Fast Chargers at public locations along major transportation corridors throughout the Bay Area, and 1,500 Blink Home Chargers at Bay Area residences. ECOtality was awarded $50,000 as Project Manager for the Air District’s EVSE Deployment Program based on their experience in coordinating The EV Project, the largest rollout of EV infrastructure in history. The Bay Area regions involved in the newly introduced program are the Air District’s jurisdiction, including Alameda, Contra Costa, Marin, Napa, San Francisco, San Mateo, Santa Clara, southwestern Solano, and southern Sonoma Counties. Through a $2.2 million award from the Air District, ECOtality will provide an EVSE Home Charger Rebate Program to install 1,500 Blink Home Chargers at Bay Area residences, out of the total 2,750 home chargers that will be installed throughout the program. The Blink Home Charger is a smart charging station that allows for increased cost-savings through improved power management, an intuitive set of features, including a 7-inch color touchscreen control panel, and a stylish, easily configurable design. ECOtality will also implement a DC Fast Charger Program, from a $614,800 Air District award, that will allow the Company to install 20 Blink DC Fast Chargers, out of the 30 total chargers installed throughout the program. The Blink DC Fast Charger is capable of providing a full charge in under 30 minutes. Each Blink DC Fast Charger is equipped with a daylight readable 42-inch color LCD display, and dual 10-inch touchscreen control panels. ECOtality’s Blink charging stations will help support the launch of EVs within the region, including the Nissan LEAF™. The funding outlay is part of an ongoing effort by the Air District to support at-home electric vehicle charging in the region and to establish a network of accessible charging sites where electric vehicle owners can conveniently recharge while conducting their normal business, running errands or traveling. Funding for the electric vehicle infrastructure program was provided through the Air District’s Transportation Fund for Clean Air Regional Fund which allocates money collected as a surcharge on vehicle registration fees. The program will also leverage cost-share funding provided to the contractors by federal and state grants and private funds. In addition to the above contracts, ECOtality is project manager of The EV Project and will oversee the installation of 15,000 commercial and residential charging stations in 17 cities and major metropolitan areas in six states and the District of Columbia, which will now include the San Francisco Bay Area. The project will provide an EV infrastructure to support the deployment of 8,300 EVs. The project is funded by the U.S. Department of Energy through a federal stimulus grant of $114.8 million, made possible by the American Recovery and Reinvestment Act (ARRA). The grants are matched by private investment, bringing the total value of the project to approximately $230 million. 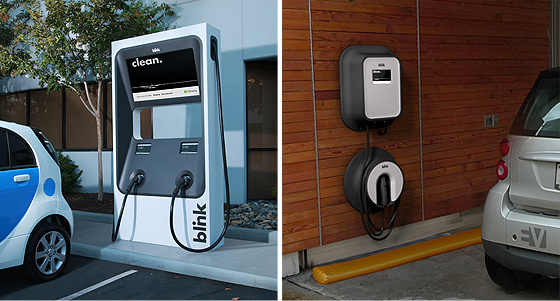 Qualifying Bay Area residents will be able to receive a Blink Home Charging Station as well as the DC Fast Charge inlet option on the Nissan LEAF free of charge, and a credit of up to $1,200 towards the installation of the charger, by participating in The EV Project. For more information about The EV Project, please visit www.theevproject.com, and for additional information about Blink charging products, visit www.blinknetwork.com. ECOtality, Inc. (NASDAQ:ECTY), headquartered in San Francisco, California, is a leader in clean electric transportation and storage technologies. Through innovation, acquisitions, and strategic partnerships, ECOtality accelerates the market applicability of advanced electric technologies to replace carbon-based fuels. For more information about ECOtality, Inc., please visit www.ecotality.com.